My close friend and long-time colleague, Michelle, died three weeks ago. She was only forty years old. We shared thousands and thousands of students together over the past eighteen years. Her classroom is on the same floor as mine, just around the corner. We coached speech and debate together in our early twenties, created an AVID program together, and both started teaching AP classes to seniors around the same time. I keep waiting for her to do what she has done for eighteen years: walk around the corner to ask me a question or complain about something she knows will annoy me as well, or merely engage in friendly gossip. Last week her seniors took their AP Literature exam and that afternoon I almost picked up my phone to text her a question about how she thought the students had performed. Beyond the classroom, I desperately want her thoughts about Season Two of The Handmaiden’s Tale since we were both obsessed with Season One last fall. I want to tell her about my summer vacation plans and hear about hers. I want to know what novel she is reading and ask her if she would recommend it to me. I guess I just miss my friend. Still . . . something more is eating at me, something enigmatic and raw, something more than grief or conventional sorrow. Perhaps it is the residue of moments I never imagined I would experience as a friend and teacher. Giving a eulogy. Posting a notice of her death on Facebook. Talking to the media about my dear friend and what she meant to our school. Upsetting moments, yes. But it was the day after she passed that continues to haunt me. There is a palpable schism that erupted that day in my life, a rupture in my teacher soul that forever changed the teacher I am. I began that day as one man and ended it as another. I cannot seem to shake the crucible of standing for four hours in front of a hundred heart-broken and shocked high school seniors, fielding their questions about Michelle’s illness, her suffering, wanting to know what it all meant. And me, in the grip of a grief so potent and suffocating there were no real words to express it, couldn’t help but shed any patina or pretense of not being utterly heart-broken as I openly wept in front of my dazed students, uncontrollably at times, tissue after tissue, and by the end of the day, box after box. Something that day changed between my students and me. Of course, students know their teachers have hopes and loves and friendships and passions and heartaches and all the trappings of a normal, private realm of life. They know when they walk into a classroom they are getting the “teacher version” of me just as I know I am getting the “student version” of them. But to stand in front of students so emotionally broken, so spiritually stripped and raw, seems to have robbed me of my cape, my uniform, and the posture I had carefully manicured for twenty years. In a single day it vanished. By the next week there seemed to be an unspoken wave of expectation from all parties that we needed to get back to work, that our time of grieving together was done, that whatever sadness remained in each of us was to be hermetically sealed into an orbit of isolated, individualized anguish. It was no longer the stuff of public display. And despite my best attempts to live up to this unspoken covenant with my students, I find myself behaving oddly these days—tearing down old pictures or plaques in my room, refusing to walk by Michelle’s classroom, fantasizing about starting over with new classes or a new school or new colleagues. You see, this is grief like I have never known, grief that now goes beyond its socially and professionally accepted expiration date. And I have no real ability to describe it. The irony of this is that I use words to teach my students. I use words to write books. I use words to speak to audiences. Words are how I acquire wisdom from texts and inspiration from poetry. Words are how I express my wonderment in the face of beauty, how I experience awe in the face of inspiration, how the enormity of grandeur becomes comprehensible to my meager heart and mind. But as I write these words—tears flowing without end, in waves, seemingly in infinite supply—I know they are empty vessels, mere signposts for the monstrousness they mean to represent. Sad. Devastated. Inconsolable at times. Distraught in a way that makes me understand for the very first time what ground-shaking, soul-crushing, epic sorrow does–it exterminates the wholeness of one’s soul in such a way that I know it will never return. Never. Not tomorrow. Not next year. Not on my deathbed. Never. I will never be truly “the same” ever again. Michelle was more than my friend and more than my colleague for almost two decades. She was both the greatest teacher I have ever known and had, perhaps, the most beautiful soul I have ever encountered in this life. She did not exist, she radiated. She was not simply nice, she was benevolence personified. You see, she was made of a soulful substance so precious and so rare in this world that strangers hearing accounts of her life and actions would surely cast a cynical eye at such ebullient descriptions. To know her was to feel the pulse of a loving heart, to be her student was to experience the palpitation of passion and the constant eruption of erudition. To be her friend was to possess the largest cosmic lottery ticket of all time. Perhaps this explains the difficulty of my circumstance, for when one works alongside a light as bright as Michelle’s, its extinguishment makes the dark all the more sudden and jarring. She battled through her illness for four months, coming to school almost every single day—even as she gradually lost her hearing, even as the right side of her face went numb, even as her balance got so bad she had to walk with one hand touching the wall. Never complaining. Never asking “why me?” Never questioning the Fates or embodying the Furies. Only occasionally did she admit to the truth of her terror, as the rapid decrescendo of life’s sounds became a whisper before finally tiptoeing upon a sinister silence, exiling her to a world with neither student questions nor her lovely daughter’s voice. Cruelly, this isn’t the article I planned to write about Michelle. I had big plans that didn’t consider, or even fathom, the tragedy that eventually unfolded. When Michelle was in the midst of battling her condition, still with high hopes of recovery, I told her I wanted to chronicle her medical journey. 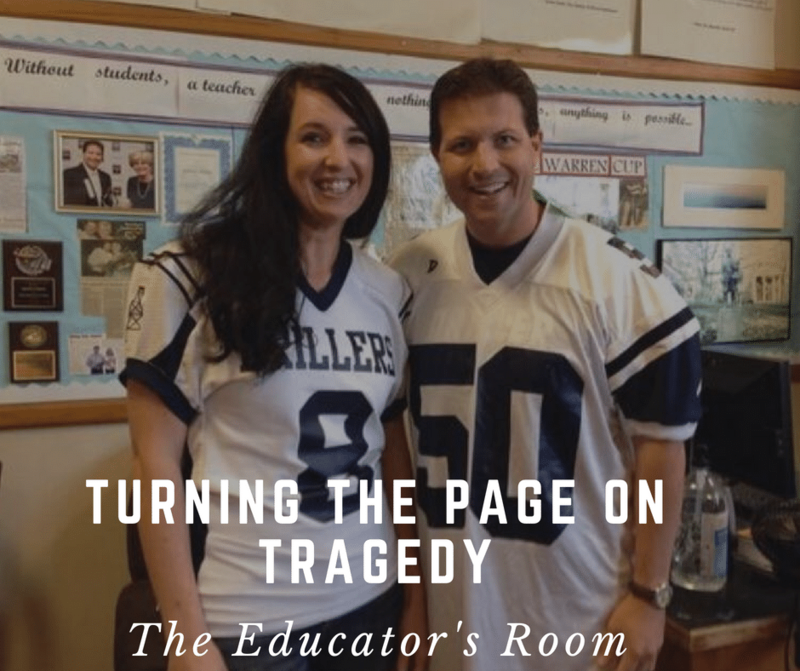 It was a story that needed to be told because it was the most vivid episode of intense bravery and fortitude I have ever witnessed in a classroom. This was supposed to be a soaring and heartening testament to the devotion a teacher can have for her students. It was supposed to portray Michelle’s noble suffering fueled in service of education. It was supposed to be an account of a teacher transcending her circumstance to ennoble the character of her students. Instead, our hearts are collectively shattered. For all of the Disneyland rides she will never go on ever again, for all the birthdays she will never have, for the books she will never read, for the programs she will never watch, for the thousands of young men and women whose lives would have flourished under her loving guidance and instruction. But most of all, our hearts are wretched when we think of her lovely daughter, for the wedding of her daughter she will never attend, for the grandchildren she will never hold, for her absence at the thousands of grandiose and miniscule triumphs and tragedies that befall each and every child’s life, moments that require the soft and loving touch of a mother. In the midst of this heartbreak, what in the world do I tell the hundreds of seniors we have in common in the waning weeks of their senior years? Every trite trope, empty axiom, and juvenile idiom about life and death are not enough to put Michelle’s death into context for anyone, much less young people standing on the hopeful cusp of life. They are young, confused, looking at me to offer up words that can uplift and soothe, words that impart an urbane and sophisticated understanding of a cruel world, words that Michelle would surely have used had the roles been reversed. Maybe it’s not fair to place this truth on their young shoulders, but this class that has endured a loss like no other, this class that observed her tragic decline, this class that started the year with Michelle at the peak of her powers and ended it by attending her funeral, have been taught the most powerful, profound, monumental lesson ever taught in the history of Bakersfield High School by any teacher to any group of students. It is a lesson as old as the gospels, as profound as the classical philosophers and as potent as any poetry. They have been offered a clarion and elegant model of what an ideal human life looks like. Everyone speaks about Michelle’s universal kindness, her ubiquitous smile, and her infinite reserve of empathy for others. But these qualities flow from a passionate soul endeavoring to live a full and worthy life, a life that was meaningful because it was not afraid to endlessly love, not afraid to embrace life’s enchantments or dance with its delights. If anyone earned their “seat at the banquet of life,” it was Michelle. I know there will come a time when I walk by her classroom without thinking of it as her classroom. There will come a time, far in the future, when I don’t bemoan the fact that my students do not have her as their senior-year English teacher. There will come a time when I stop looking down the hallway, picking up my classroom phone to call her, or looking for her car in the parking lot each morning. I know the potency of this heartbreak will soften over time and maybe, just maybe, someday I will simply be thankful for the twenty-five years we were friends. My students and I haven’t mentioned her death for about a week now. I don’t know how they are feeling and none of them have broached her loss with me. They have been taking AP exams. They graduate in two weeks. Their lives are about to springboard into a new phase, adorned with new places and new people. I envy them. Because when they are gone in a few weeks time, I’ll be left in the same classroom, at the same school, left wondering if I will ever feel the same joy I have felt for twenty years of teaching. Michelle taught books that often didn’t have happy endings—Hamlet, The Inferno, Things Fall Apart. Her own ending is the embodiment of tragedy. And because of this, it is a story that will stay with me . . . forever. I am so incredibly sorry for your loss. Your words are beautiful, and I hope that writing this helped you in some way. While I haven’t lost a close colleague, one of my 4-year choir students who graduated last May passed away suddenly in February. Her senior picture is taped to my wall above my desk, alongside her peers’ photos, and I encountered her name over and over today as I updated our spring concert program for this year. I’m heartbroken to think of all the dreams she had that will remain unfulfilled on earth, but thinking about her sweet and gentle nature helps me smile through my tears. May you also find peace in the midst of your storm. and share the tears in their eyes with her own.